We mentioned this week in our regular #TrendlineWednesday feature on Twitter and StockTwits that many of the key trendline tests that we highlighted over the past few weeks have played out as a result of the recent bounce in stocks. Thus, we used this week’s feature to update some of the major longer-term trendline developments still unfolding in some of the other key asset classes, like gold, the dollar and interest rates. One other asset that we thought about mentioning was the Swiss Franc. However, we held off because prices hadn’t quite reached the trendline in question — until now. Specifically, it is an exchange-traded product — the PowerShares CurrencyShares Swiss Franc Trust (ticker, FXF) — that is in our spotlight. 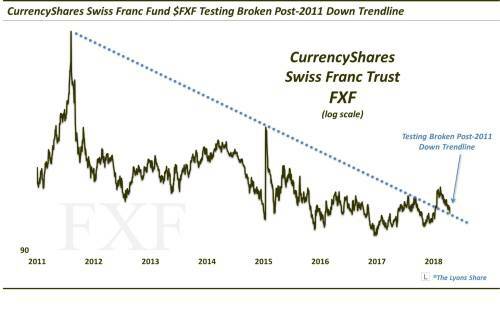 In January, the FXF broke out above the Down trendline stemming from the epic 2011 blowoff top and connecting the SNB-induced spasm high in early 2015 as well as the high from last fall. After spurting higher for about a month, the FXF has steadily pulled back, retracing the entire breakout move…and then some. At the present time, the FXF is testing the top of that broken post-2011 Down trendline. Will this former resistance line serve as support? That is the theory — and from our experience, it is a pretty reliable tendency. We also like the fact that it is approaching the 61.8% Fibonacci Retracement of the rally from the low in December 2016 to the recent peak in February. If it immediately fails and blows right through the trendline, it would certainly be a bad sign. However, especially given an equity market that may be on thin ice, or at least range bound, it may pay to look for opportunities elsewhere. And the long side of the Swiss Franc from these levels may represent a good risk/reward opportunity. The Guggenheim CurrencyShares Swiss (FXF) closed at $96.38 on Friday, down $-0.39 (-0.40%). Year-to-date, FXF has declined -0.46%, versus a -0.09% rise in the benchmark S&P 500 index during the same period. FXF currently has an ETF Daily News SMART Grade of A (Strong Buy), and is ranked #4 of 17 ETFs in the Currency ETFs category.